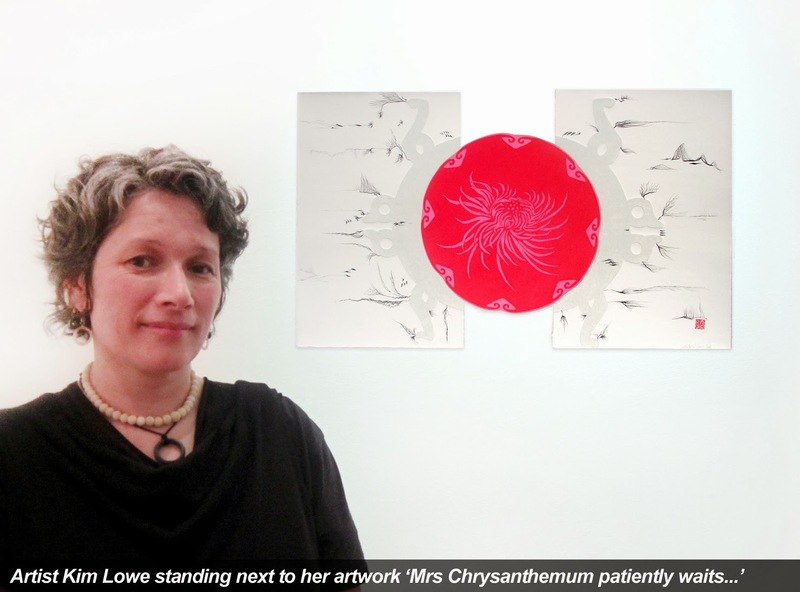 In Mrs Chrysanthemum patiently waits..., artist Kim Lowe employs a diverse range of printmaking techniques to depict the varied extracts of her family's mixed New Zealand Chinese and Pakeha history. Lowe draws upon the wealth of stories surrounding her ancestral history and the marginalisation of pioneering NZ Chinese migrant families. The prints in the exhibition relate to her paternal grandmother of Chinese origin who was born in Cuba and then brought up in New Zealand. “Even though she had been in New Zealand since she was 6 or 7 she still kept her Cuban passport so was classified as a NZ alien because she refused to denounce her Chineseness”, says the artist. Akin to her grandmother the artist resiliently represents her mixed cultural heritage, through her chosen art medium of print. 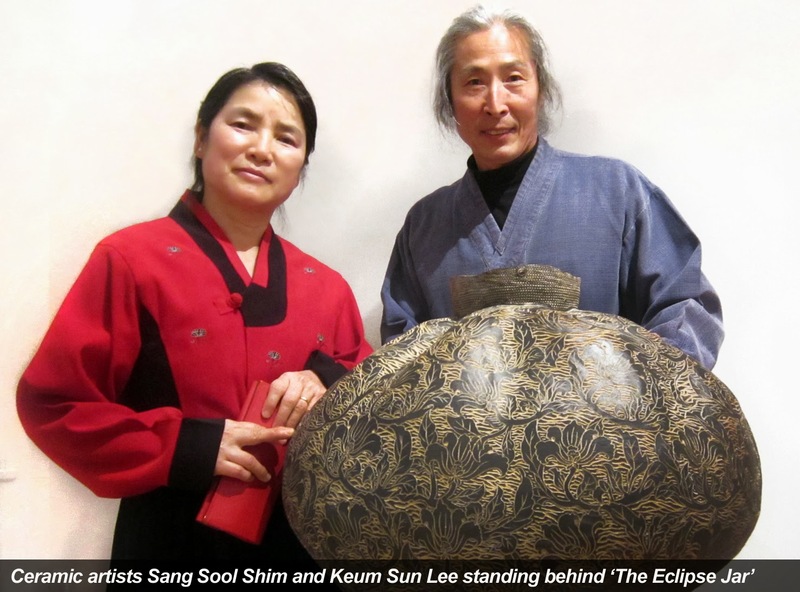 Both printmaking and working on paper connects to European and Chinese art traditions. Even the fundamental act of making prints requires a negative image to create the positive printed image, this relates to the artist’s interest in the Chinese concept of polarity where opposites are necessary to create balance. Also embedded in Lowe’s works are visual symbols and motifs from Chinese and European art history and antiquity. Cultural hybridity, elements of Taoist Philosophy and nature are often starting points for the artist. A more recent influence for the Christchurch based artist has been the 2011 earthquake. Making the best out of the aftermath Lowe has incorporated by products from this destructive natural disaster. Earlier works in this exhibition, 96 Lotus Feet (2007) and Underbellies (2007), were damaged by liquefaction during the quake. The artist has chosen to retain the liquefaction on these works and new post-quake works adopt the same grey palette. Not only as a response to the quake the grey also symbolises Lowe’s recollection of visiting her ancestral house in China, where everything was caked in a similar coloured dust. Kim Lowe is a Christchurch based artist with an art practice grounded in printmaking and painting that centres around mixed cultural identity. In 2009 Lowe completed a Master of Fine Arts from Ilam School of Fine Arts, University of Canterbury. Recent art projects include coordinating the Sendai-Christchurch Art Exchange in response to the 2011 quake and tsunami events in Christchurch and Japan. Lowe recently returned from presenting at IMPACT8 International Printmaking Conference in Scotland. 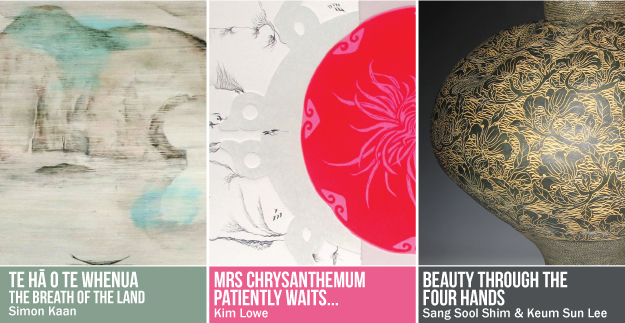 Corban Estate Arts Centre's latest exhibitions by Simon Kaan, Kim Lowe, Sang Sool Shim and Keum Sun Lee, explores hybrid Asian identities through painting, printmaking and ceramics are on display from 13 September to 20 October 2013. Dunedin based artist Simon Kaan, examines whenua (land) issues in this latest exhibition. Through multiple art disciplines the exhibition investigates the connection of land with water, to consider the responsibility of belonging to a place. This exhibition features landscapes that combine visual motifs inherited from the artist’s, Kai Tahu and Chinese ancestry. Kim Lowe is a Christchurch based artist and printmaker of New Zealand Chinese and Pakeha descent. Lowe’s latest exhibition of prints features new works based on past events and snippets of her diverse family's history. Sang Sool Shim and Keum Sun Lee are self-taught potters, together they collaborate on large and small scale ceramic works. Hand thrown by Shim and intricately decorated by Lee, they work with both traditional Korean and contemporary ceramic techniques. Their artworks are influenced by their cultural heritage and a life set in the Waitakere Ranges of Auckland. On Saturday 14 September, 10.30am artists Simon Kaan and Kim Lowe will present a joint exhibition talk, presenting an opportunity to hear these two South Island based artists. Simon Kaan, Untitled (detail), 2013. Courtesy of Sanderson Contemporary Art. 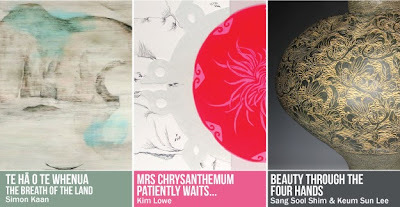 Kim Lowe, Mrs Chrysanthemum patiently waits.... (detail), 2013. Sang Sool Shim and Keum Sun Lee, The Eclipse Jar (detail), 2012.